Melbourne has over 24,000 km of waterways – about 98 times the length of the Great Ocean Road, from end to end. Ensuring the region’s waterways are healthy, liveable and accessible for future generations is a complex task – and one that many in the community have stepped up to. Over the years, many individuals have offered their knowledge, expertise and experiences, and we have continuously sought to strengthen the voice of the community in our planning. It is the community that formed the backbone of this Strategy. From April 2017 to July 2018, we reached out to Traditional Owners, nature enthusiasts, academics, local governments, small business owners and others; the response was been overwhelming. Over 630 individuals representing over 220 organisations via 23 workshops partnered to shape the Strategy, from project inception in September 2016 to formal consultation on the draft in July 2018. The major mechanism for this participation was through Region-wide Labs and Catchment Collaboration Workshops, where people shared their experiences and ideas on waterways management and worked together to set targets and goals. Why the focus on collaboration? The vision explores the question of what the catchment’s waterways will be in 50 years, and is intended to be an inspiring and credible challenge. The goals look at what we want to achieve in more than 20 years. Underpinning the goals are targets, or quantifiable changes to reach in 10 years or more, which are in turn supported by 10-year performance objectives. Previously, the community identified what they value about our rivers, creeks and other waterways, such as birds, fish, and being able to use the waterways for recreation. These became known as ‘waterway values’. Targets for each waterway value ensure we stay on track to achieving our goals; these apply to a timeframe of 10 years or more. Waterway targets measure the improvements that are required inorder to achieve the waterway values. Targets have been set for waterway conditions and key values. Example 1. For people to be able to enjoy a waterway (known here as ‘amenity’, a social value), it is important that they can access it. Thus, access is an essential waterway condition for amenity. Example 2. For frogs (known as an environmental value) to flourish in a particular river, it is important that the water is of certain quality. Thus, water quality is an essential waterway condition here. 10-year performance objectives help indicate progress towards improving the longer-term waterway targets, and hence waterway values. Rather than providing specific actions, the Co-Designed Catchment Programs aim to provide a flexible framework for meeting the outcomes in the performance objectives, waterway targets, goals and vision. Monitoring activities will inform our evaluation of and reporting on how the Strategy is being implemented. We will be evaluating the extent to which the outcomes have been achieved, and using the information to provide direction for subsequent planning. Legacy – after the activity/program ends. In reporting, we will be using tabular and spatial information. An annual report will be made centrally. We will also be reporting according to the arrangements determined by each Catchment Collaboration community, as well as to the public in the third, sixth and ninth years. 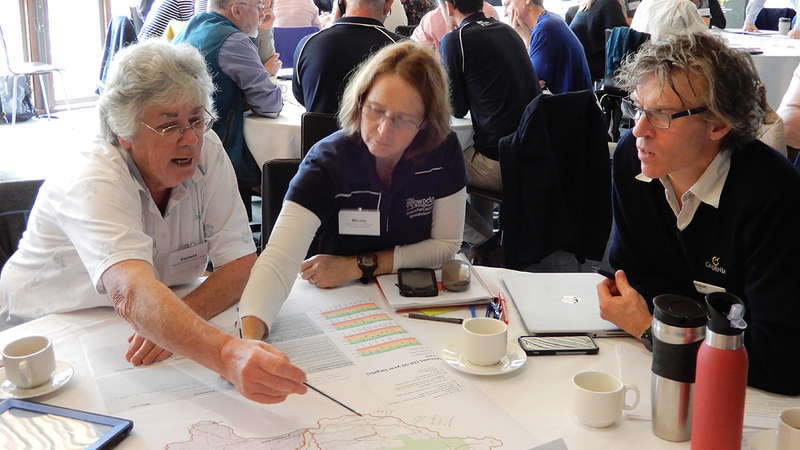 The Strategy was largely drawn from input by the community, especially from the Catchment Collaborations. Find out more about what happened during the workshops, the presentations given, and the outcomes. This series of forums (labs) brings together participants from various organisations and groups such as: universities, community groups, industry groups and local governments.